Noble Square Tube Stall Fronts & Dividers are made out of 2" x 2" square galvanized steel with vertical round tube grills. They are custom built to your specifications using only the finest material available (see also: Stall Dividers). 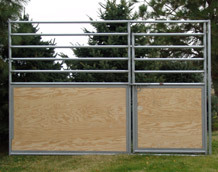 Noble Event Stall Fronts & Dividers are made out of 1 7/8" OD round galvanized steel tube with horizontal bars. This is a high quality stall system at a very affordable price. 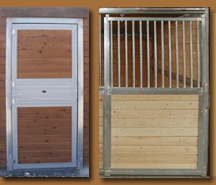 Noble Panels offers a Square Tube Stall Doors can be used as an interior stall door or as an exterior paddock door. We also manufacture a Dutch-Style Exterior Paddock Door (pre-hung in a door frame). Custom Stall Grills are also available for Fronts, Dividers or Window Grills. A sequence of 12x12 Event Stalls in a side-by-side and back-to-back layout. 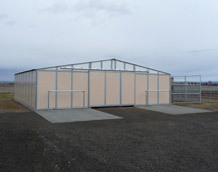 A great economical solution for facilities who require the most number of covered stalls using the least amount of space. 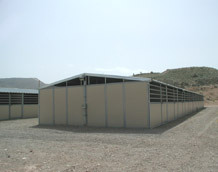 Noble Trainer Series Barns is an easy to erect, pre-fabricated modular stall barn. It is expandable and can be added onto at any time. 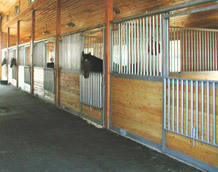 The interior of the barn can be customized with tack rooms or open hay storage bays as well as 12x12 or 12x24 stalls. 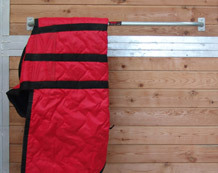 Don't forget other Noble products that can help you organize your barn.